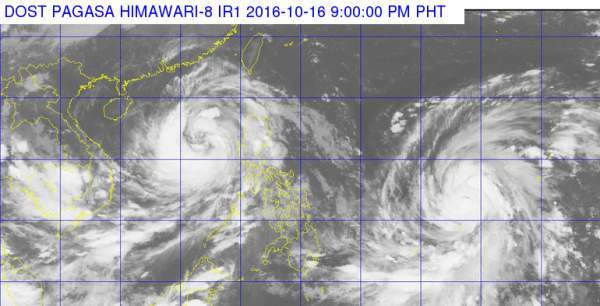 Bagyong KAREN Updates, Forecast, Storm Signals and Track (October 17, 2016) | #KarenPH - Balita Boss! Philippine Atmospheric, Geophysical and Astronomical Services Administration (PAGASA) said that Low Pressure Area (LPA) monitored since Tuesday in East of Luzon has developed into a tropical depression and was named "Karen". PAGASA expects the Tropical Depression Karen to leave the Philippine Area of Responsibility (PAR) on Monday. Here's the weather updates on Bagyong KAREN from the state weather bureau. TYPHOON "KAREN" IS NOW OUTSIDE THE PHILIPPINE AREA OF RESPONSIBILITY (PAR). According to the weather advisory of PAGASA, issued at 4:30 a.m., Bagyong Karen, as of 4:00 a.m., was located based on all available data at 565 km West of Dagupan City, Pangasinan (OUTSIDE PAR)(16.7°N, 115.1°E) with maximum sustained winds of up to 130 kph near the center and gustiness of up to 200 kph. For latest updates, kindly check below the Tweets about "#KarenPH" .